It was another busy weekend for the GPRC Wolves Cross Country Running team. 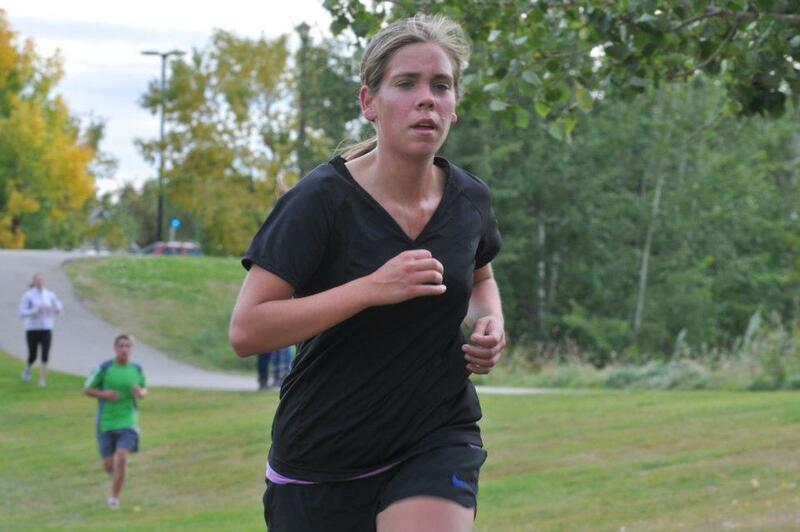 Saturday at the Bezanson Bog, race #4 in the 2011 Wolves Cross Country Running Series, GPRC runner Kayla Hardy won her third race in as many weeks. The 18 year old defeated all other female competitors in the featured 6 km distance, covering the hilly and rooted course in 29:07. Wolves runners swept the next three places. Amanda Patteson placed second, ahead of Lena Farrow in third, and Assistant Coach Mallory Pinnock in fourth. Wolves veteran Devin Woodland was victorious in the mens race, clocking 24:33 for the 6 km, 13 seconds better than Beaverlodge Regional High School’s Hayden Hollowell. Wolves rookies Duncan Farrow and Jack Carrigan battled for the bronze medal, with Farrow outleaning Carrigan at the finish. On Sunday, Wolves Coach Bill Corcoran and athlete Chris Ward contested the Fall Classic 10 km road race in Grande Prairie. Corcoran recorded a third place finish in 41:20, 9 seconds and one place better than Ward. The race was won by Grande Prairie’s Scott Goosney in 39:52, 45 seconds ahead of Leonard Scharbach. Also of note, former Wolves runner Fiona Benson was named the Alberta Sport Development Centre – Northwest Female Athlete of the Year on Saturday night. The award was announced at the High Performance Sport Recognition Banquet at the TEC Centre. Benson bested fellow nominees 2010-11 CCAA Female Basketball Player of the Year Andria Carlyon and local high school volleyball standout Jaden Douvelle. The local cross country running season continues this week on a number of fronts. Wolves Series Race #5 goes Wednesday near Wanham and Race #6, the Tumbler Ridge Ramble, is slated for next Saturday. Also on Saturday, The GPRC Wolves team will be in Calgary to contest ACAC Grand Prix #4, hosted by SAIT. This entry was posted in Cross Country, Uncategorized and tagged ASDC Northwest, Cross Country Running, Fiona Benson, GPRC Wolves X-C Running, Grande Prairie Alberta, Running, Wolves. Bookmark the permalink.